Besides, Africa’s working age population is set to surpass that of China or India by 2034. With 15 million people entering the job market annually, Africa risks turning its demographic dividend into a demographic disaster if its economies cannot create enough jobs and opportunities for its citizens. Ironically, the challenge of slower growth presents an immense opportunity, as it is forces African economies to look inwards to re-ignite economic development. Africa still boasts some of the biggest factors of long-term growth, from a growing workforce to its rapid urbanization and dramatic natural resource endowments. Africa is forecast to be the second-fastest growing region in the world by 2020, and faces tremendous opportunity through the ongoing technology revolution and development of its manufacturing sector to respond to domestic needs, increase intra-African trade and export to other regions. Across the continent, governments are working on new strategies to diversify their economies and increase their levels of productivity and competitiveness to spur job creation and achieve more long-term, sustainable growth. 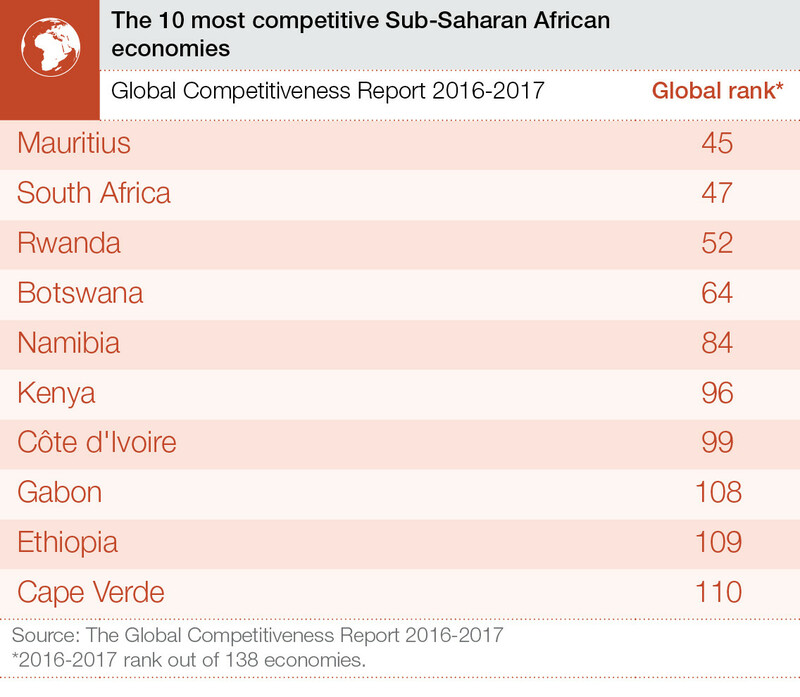 The current regional competitiveness landscape continues to be divided between those economies that feature in the top half of this year’s Global Competitiveness Index – Mauritius (45), South Africa (47), Rwanda (52) and Botswana (64) – and the 15 economies that are among the bottom 20 economies. While some progress has been achieved in the doing-business environment, infrastructure and ICT, it has been insufficient to improve overall productivity levels. Productivity gains are achieved through new ideas, new business models and by incorporating new technologies into existing production processes. The good news is that creating successful African companies may require less capital and more creativity and new business thinking in the future. But, as the Fourth Industrial Revolution proceeds, innovation and technology are becoming more important than ever, particularly in emerging economies. This brings two major challenges in the African context. First, as technological readiness increases its impact on economies and societies, availability of electricity and internet connection will become prerequisites for development to the same extent as transport and water infrastructure. In a region where funding for infrastructure has been chronically insufficient, expanding the investment capacity will not be straightforward, especially in a time of economic slowdowns and shrinking public revenues. At the same time, higher uncertainty about financial risks could also reduce private investment and tighten credit. Second, advanced skills will be complementary to capital in generating growth through the establishment of innovative and successful firms. Yet, investment in education is equally lacking and African young people are less incentivized to make this investment if attractive employment opportunities are not available, even in the most advanced economies in the region (see Figure 2). To break this impasse, new funds are needed. Internally, management of public finances can be streamlined and better channelled towards these critical investments, which will enable local market development and long-term growth. On the global scene, capital is not scarce, but many investors are holding their cash and waiting for high-return opportunities. To attract relevant investments, African economies need to reassure international investors that they can provide such opportunities. This requires not only improving market efficiencies, but also increasing trust by making sure that property rights are protected and creating a climate of social stability and cooperation among all African stakeholders. African leaders from both the public and private sectors need to work together to break this impasse and create the conditions needed for regional markets to thrive. More than ever, responsible leadership is needed to turn the continent’s “youth bulge” into a source of prosperity rather than a cause of social unrest. Investing in girls and empowering women in particular will yield higher developmental returns. Strengthening institutions, improving infrastructure and investing in education, health and technological readiness are priorities for all African economies. These will enable local market development, attract foreign investment and create the jobs that will unleash the potential of the African demographic dividend. A nation growing without its people is doomed to fail. Creating opportunities for its citizens is the only way for Africa to prosper.